The revolutionize your multitasking, Samsung has launched, all new Samsung Galaxy Grand Prime 4G with Snapdragon 410 in Indian market on 31st July priced at Rs 11,100 White and Grey colour option. Today Samsung Galaxy Grand Prime 4G is available on the company’s e-store. It will counter Xiaomi, Lenovo in mid-range market. The all new Samsung Galaxy Grand Prime 4G supports Dual-SIM, Micro SIM with 4G LTE, NFC, 3G (HSPA+), Wi-Fi, Micro-USB 2.0, Bluetooth 4.0, and A-GPS/ GLONASS offers you a 5-inch qHD TFT display with resolution (540×960 pixels) deliver crystal clearer images with deep contrast with wide-angle viewing in any condition even under bright sunlight. Samsung Galaxy Grand Prime 4G runs on Android 4.4 KitKat OS powered by a 1.2GHz quad-core Snapdragon 410 processor with 1GB RAM perfect for multi-tasking offers faster browsing, superior gaming environment and allows you enjoy millions of apps from Google play store while 8GB internal memory 64GB external memory offers plenty of space to store your data. 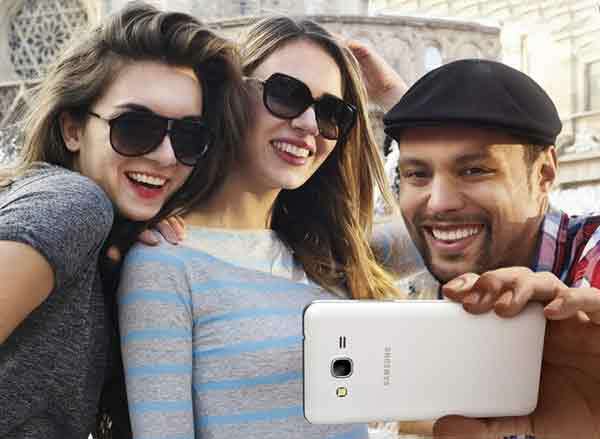 Samsung Galaxy Grand Prime 4G sporting a 8-MP Primary autofocus camera with LED flash, and a 5-MP front-facing camera with Wide Selfie, Palm Selfie, Animated GIF, Beauty Face Features, and Rear-cam Selfie allows you to take perfect selfies in high-resolution. It’s packed with a 2600 mAh battery with Ultra Power Saving Mode offers you 16 hours of talk time in 3G and web browsing up to 9 hours(3G), up to 10 hours(LTE) and up to 12 hours(Wi-fi) measures 44.8×72.1×8.6mm and weight 156gm. Samsung recently launched two smartphone from “J” series, Samsung Galaxy J5 and Samsung Galaxy J7 priced at Rs 11,999 and 14,999 respectively. Samsung soon going to launch Samsung Galaxy A8. The all new Samsung Galaxy J7 supports 4G LTE, Dual-SIM, Micro Sim with 3G, Wi-Fi 802.11 b/g/n, Micro-USB, A-GPS, Bluetooth 4.0, 3.5mm audio jack, GPS, Glonass, and FM radio comes with a bigger 5.5-inch (720×1280 pixels) HD TFT display runs on Android 5.0 Lollipop OS powered by a 64-Bit octa-core Snapdragon 615 (four 1.4GHz cores + four 1GHz cores) with 1.5GBRAM which offers you superior gaming environment and allows to run your apps smoothly while 16GB internal memory and 128GB external memory sporting a huge 13-MP Primary autofocus camera with LED flash and CMOS Sensor and for clicking selfies and video calling it offers you a 5-MP front-facing camera with 120 degree viewing lance. It’s packed with a 3000mAh battery measures 152.2×79.1×7.9mm and weight 168gm including. While The all new Samsung Galaxy J5 supports 4G LTE, NFC, Dual-SIM, Micro Sim with 3G, Wi-Fi 802.11 b/g/n, Micro-USB, A-GPS, Bluetooth 4.0, 3.5mm audio jack, GPS, Glonass, and FM radio comes with a bigger 5-inch (720×1280 pixels) HD TFT display runs on Android 5.0 Lollipop OS powered by a 1.2GHz quad-core processor with 1.5GB RAM which offers you superior gaming environment and allows to run your apps smoothly while 16GB internal memory and 128GB external memory sporting a huge 13-MP Primary autofocus camera with LED flash and CMOS Sensor and for clicking selfies and video calling it offers you a 5-MP front-facing camera with 120 degree viewing lance. It’s packed with a 2600mAh battery promising talk time up to 342 hours measures 142x73x8.5mm and weight 149gm. At last few honest word from heart, Samsung Galaxy Grand Prime 4G is the best smartphone under Rs 12,000. What you think? please be open to give your view.